Heat oil in a pan ,add chopped garlic and saute it. Add chicken masala powder and stir well. Then add chopped tomatoes, ginger, half of coriander leaves and saute well. Add chicken pieces and salt, mix well. Do not add water. Cover and cook in a low flame, stirring in between. 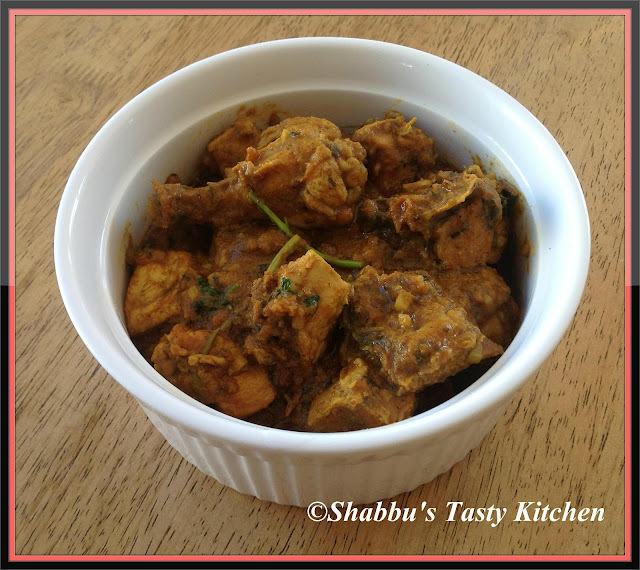 When chicken is cooked, stir in kasuri methi and garam masala. Add coriander leaves and serve hot. Such a yummy n lovely preparation...looks inviting!! Thanks for sharing!! tempting Methi Chicken!!! Great recipes and clicks, Thanks for stopping by my blog. Happy to follow you too. Yummy chicken.. I love the methi flavour. I love this combination of flavours.. wonderful.. Your Methi chicken inviting me !!!! hi shabbu, i love chicken recipes.. looks very tempting..
your chicken recipe looks delicious. Methi chicken looks delicious and flavorful. Happy to follow you too! Methi and chicken together works out wonder together, lovely curry..